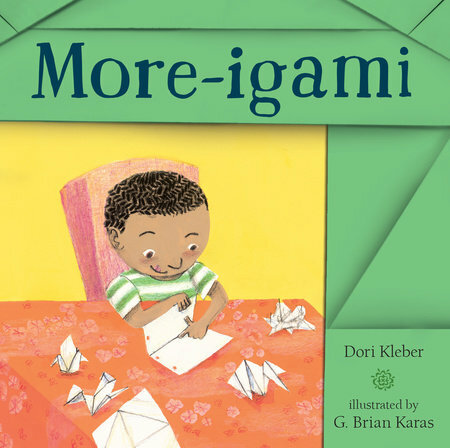 More-igami is the debut picture book from Dori Kleber, illustrated by longtime favorite G. Brian Karas. 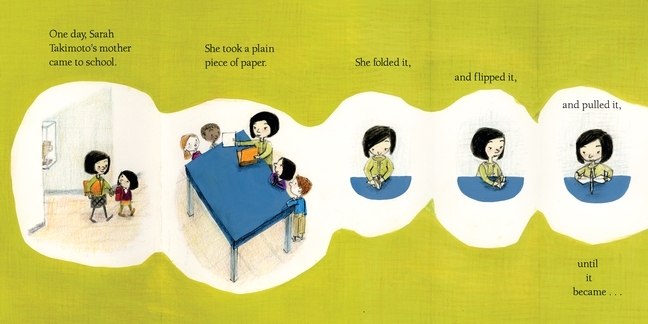 More-igami is a fantastic picture book for so many reasons. The main character shows perseverance or, grit, to use the hot new word in the world of education, as he struggles to master a skill. More-igami is a marvel of diversity in a picture book, featuring African American, Asian and Hispanic characters. But, best of all, More-igami is just a really great story with marvelous illustrations that is a joy to read our loud. Joey loves all things folded, from maps to accordions to tacos to, of course, foldaway beds. When Joey's classmate, Sarah, brings her mother to school to teach the class how to make origami cranes, Joey's mind is blown. Mrs. Takimoto tells Joey that she can teach him the folds, but if he wants to be an origami master, he'll "need patience and practice." No problem! Joey practices everywhere with everything, including folding the $38.00 he found in his mother's purse. Frustrated and out things to fold, Joey heads to the restaurant next door because "fajitas always made him feel better." There, he finds a place to practice folding and help out Mr. Lopez. Even better, he finds a new friend to share his talent with - as long as she has patience and is willing to practice! Karas's illustrations are perfectly matched to Kleber's text, which wonderfully, simply shows the frustration and determination that Joey possesses. The hand drawn texture of Karas's illustrations add to the creative feel of More-igami, which will undoubtedly inspire readers to do some folding of their own, especially since there is a two page spread at the end of the book that shows you how to fold an origami ladybug!